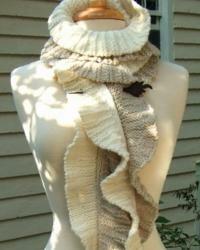 This is a great skill-building design, yet is rhythmical to knit and fun to wear! I knit two samples, one short and one very long. It's the kind of design that you can just knit until your yarn is used up, if you want to, and not worry about the length. Cascade Yarns Eco Peruvian wool yarn is used in the long version and Patons Grace is used, double, in the shorter version.